Painted word attract me lot. I want to see Painted Sandgrouse, Painted Francoline, Painted Spurflow and etc. This time when we visited the Kutch, This birds are in my tops list. It was not that we did not see this birds. But any how we want to see it again and again. We were luck to see this birds. This bird spend good time with us when we see them. The painted Sandgrouse is a resident bird found throughout the central, north western India. It is a terrestrial bird usually seen in pairs. 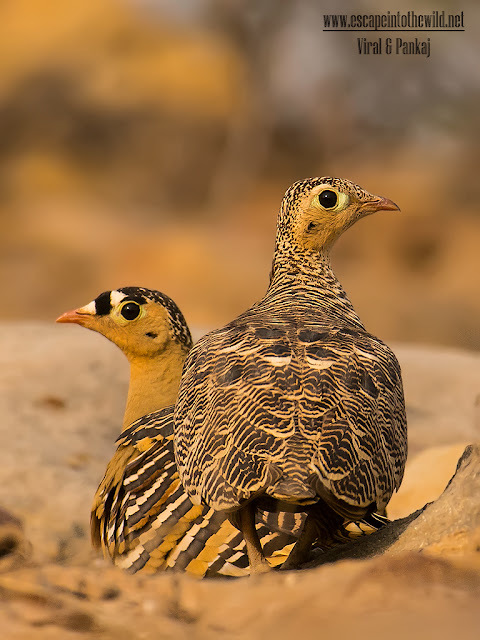 It is found in areas of low rainfall on sandy and gravelly plains with tussocky grass and………..
Local name of Painted Sandgrouse (Pterocles Indicus) is રંગીન બટાવડો. The painted Sandgrouse is a plump ground-dwelling bird with a small head and short legs. It is gregarious and groups congregate at waterholes to drink. Size of Painted Sandgrouse is between 25 cm to 30 cm including the tail. The Weight of adult is between 170 g. to 240 g.
They have Swift flapping flight. Breeding takes place at any time of the year and is dependent on rainfall. Female lays 2 or 3 pinkish-grey eggs with brown markings are laid over the course of a few days.